Patience and persistence are keys to fishing success, and perhaps no fisherman, famous or otherise, offers a better example of this than George Bush. 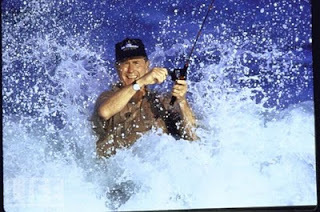 While taking a three-week vacation in August 1989, Bush went fishing for bluefish nearly every day off Kennebunkport, Maine. His first day produced no fish. He didn't catch any on the second day, either, or the third, fourth and fifth days. Soon, his inability to hook, let alone catch a bluefish grew into a national story. Sixth, seventh, eighth, ninth days -- no fish. Adding insult to injury, someone on the press boat caught an 18-pound bluefish, prompting Bush to reply, "There's no justice here. That's not fair." On the 10th day, he took Reverend Billy Graham, no doubt hoping for divine intervention. No luck. No fish. The Portland Press Herald began running a daily box score called "Fish Watch" that had a bluefish in the middle of a red circle with a slash through it. Expert fishermen were quoted in USA Today and other publications on how to catch bluefish. "It's gotten out of hand," Bush said while standing next to Canadian Prime Minister Brian Mulroney. "When I see it on national television, I know I've got to put an end to this monkey business. "Between now and when I leave on Monday, I guarantee you -- I positively guarantee you -- that this jinx will be broken." Bush continued his fishless streak. Fishing outing Nos. 11-17 produced nary a bluefish. He did catch a four-inch pollack but refused to call an end to his streak. Finally, on the 18th fishing trip, the president hooked and landed a 10-pound bluefish. It was no doubt the most celebrated bluefish in history. "The jinx is broken," Bush proclaimed. "I saw a bunch of birds and started to reel in, and wham. It's been a long, dry summer, but it all worked out. This is icing on the cake." really interesting that president Bush fishing. But sad to say fish less.